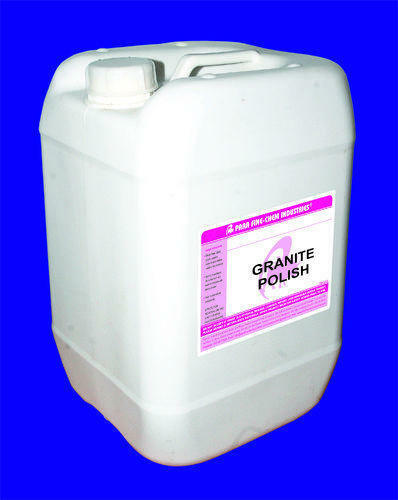 Granite polishing cleaner contains abrasives and chemicals that react with the granite surface to create a deep shine and bring out the natural color and beauty. It can even remove rust stains and scratches developed from long storage time. Established in the year 1994, Para-Fine Chem Industries introduces itself as a renowned name involved in Formulations and supply of Industrial & specialty chemicals. We have more than two decades of experience in showcasing the better side of Chemistry. Para Fine is a Proprietorship company, based out of Bangalore. Our focus is to deliver highest quality products, which in turn has helped us stay ahead of our competitors. Our range of chemical products comprises of Industrial Chemicals & Solvents, Acids, Alkalis, Cleaning Chemicals, Rust Preventive Chemicals, Paint Strippers, Thinners, Construction Chemicals, Electro Plating Chemicals, Electronic Chemicals etc. In addition to the above, we undertake Product Development and R&D. Our products have acquired huge accolades from our clients. We enjoy long-term business relationship with them. Adopting environmentally friendly and quality conscious practices, we target to offer our clients with products that are designed to meet and exceed their expectations.